What Makes One Well Better Than Another? 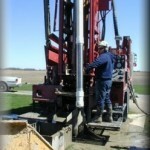 This aquifer is the well driller’s target. Once the aquifer has been drilled in to, a screen must be installed at the bottom of the casing to keep sand and gravel out and let water in the well. With no screen, the sand could quickly destroy the pump and plug the well. Screens can be nothing more than a length of casing with a few slots torch-cut into it and/or PVC slots. In practice, these “screens” can be troublesome. Sand can enter the well and restrict incoming water. Short well life and poor efficiency are characteristics. Various other designs offered some improvement, but a manufacturer’s stainless steel well screen is the best choice. 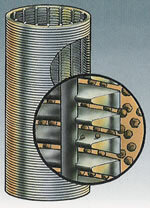 Unlike other types of screens, a stainless steel well screen uses a unique design consisting of a series of steel support rods around which a continuous length of wire is wrapped. Each intersection of wire and rod is automatically welded, making a very strong cage-like cylinder with one continuous slot spiraling along its full length. The slots are very narrow and designed to keep out find sand grains. The total open area for the water to enter a properly developed stainless steel screen is far higher than any other kind of screen design. More water comes in to the well, which minimizes drawdown of water in the well. The more a well draws down, the more energy (hp, length of pipe and wire) it takes to pump it. Properly selecting the right slot openings and developing the screen with air compressor, surging, and drilling techniques. Part of well construction involves a process called “well development,” in which finer sand grains are pumped into the well and removed. By the end of the process, only the larger sand and gravel particles are left next to the well screen. The water then passes freely around these coarse particles and enters the well. Remember that every drop of water from your well must first pass through the well screen. A Johnson® well screen is stronger, more plug-resistant, longer lasting, and more efficient than any other screen design available anywhere. That means more water for you, for a longer time, at less cost. Have more questions about our well screens? Over 42,000 gallons of water are needed to grow and prepare the food for a typical Thanksgiving dinner for eight.